*This post was first published on Matt Miller’s Ditch That Textbook blog. Living in the 21st Century where many students have access to 1:1 devices at school and even more devices at home, Digital Citizenship is a highly important topic our students need to understand. Curriculum’s world wide mandate the need to teach students about Digital Citizenship, yet many teachers find it quite daunting to teach their students these vital skills to ensure their safety in online spaces. Educates students to not talk to strangers online. Popcorn is an extremely positive and friendly chicken. She interacts beautifully with her real life friends, but is then engrossed in a digital device she finds, continually replying to messages while not knowing who they are from. Popcorn invites these unknown characters to her house as she thinks they are being her friend. She quickly realises that when they turn up, they are wolves that want to eat her. Popcorn is very lucky her real friends come to save her from the wolves. Educates students about sharing photos and videos online, interacting with unknown people, and finding the balance of when to switch devices off. A range of short stories that incorporate Augmented Reality, via the Zapper app, to engage students. Each story has reflection questions to ensure students understand each stories concept. The characters explore the concepts of uploading video and images to social media, cyberbullying, strangers online, and screen time. The end of the book provides teachers and students with scenarios and quizzes to test their knowledge and create discussions around digital citizenship. Educates students to be cautious online and seek adult clarification and/or assistance when unsure. 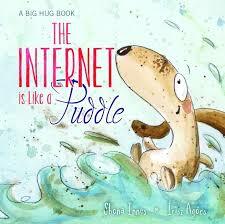 The Internet is Like a Puddle compares the wonderfulness of the internet with playing in a puddle as a child. Both can be extremely fun, but we really don’t know what is happening behind our phone, tablet, or screen, like we don’t know how deep a puddle is until we jump in. By spending too much time on the internet you can get into tricky unsafe situations, when you need to tell an adult if you are unsure to ensure your safety. Educates students that there is much more to life than playing games online. Charlie loves playing computer games. But, when his house loses power, he is unable to play his game and is terribly upset. It takes Charlie a long time to find something to do that he enjoys that doesn’t require power. He eventually plays hide and seek with his sister and finds that he really enjoys it. 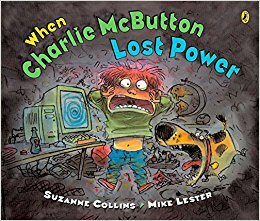 When the power comes back on, Charlie is extremely excited to play his computer game once again, but he is also excited to limit his play so he can continue to play unplugged games. Educates students to seek permission from an adult before interacting online. The fairytales we all love are altered when Jack finds a laptop and connects to the internet. Cinderella immediately does a lot of online shopping to get ready for the ball, the Big Bad Wolf begins gaming, while the Three Little Pigs purchase materials for their house. This is all great until Cinderella receives the bill, and the Three Little Pigs become bored as the Big Bad Wolf is too busy gaming to blow their house down. Rapunzel and Little Red Riding Hood appear and altogether each fairytale character realise that if they check with the Fairy Godmother before they use the computer everything will be just fine. Educates students to seek permission when online shopping, talking to unknown friends, and sharing photos. The little chick easily purchases gifts online for all her animal friends. This is all great until dad receives the bill to pay for these purchases. Without permission the little chick starts talking to and sending photos of herself to strangers. When she has the chance to meet this stranger she realises that she has actually been talking to a fox that wants to eat her. Educates students to find a balance between online gaming and real life activities. Jasper spends hours playing video games trying to get to the next level before his friends. This in turn affects his relationship with his mum and sister, his grades at school, his soccer, and his sleep. All Jasper can think about is playing his game. When Jasper finally listens to his mother and limits his computer game play to one hour a day, he sees his grades improve, his soccer improve, his relationship with his sister improve, and still he is able to enjoy his one hour of computer game play a day. Educates students to act positively online. 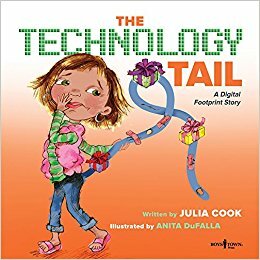 The Technology Tail uses the analogy of a tail as a digital footprint. For each positive online interaction your tail grows stronger, but for every negative interaction, your tail receives a tear, scratch, or bruise. It reinforces the fact that everything you post on the internet is always going to be there, which means future employees will be able to view your online interactions and potentially decide to give you a job or not based on your tail. What are your favourite picture story books to teach your students about Digital Citizenship? This is a brilliant post! I hadn’t heard of any of these books! Thank you.